Image courtesy of Sidewalk Flying of Flickr. From the first time I participated in some of our local startup accelerator’s programming, I got excited about exposing my journalism students to creative, forward-thinking entrepreneurial culture. 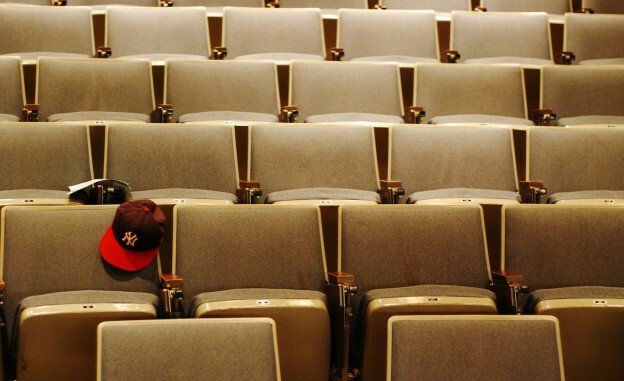 For many students, the hurdles to starting their own successful media businesses may be substantial, but no matter what, a problem-solving attitude and knowledge of economic fundamentals are increasingly important in today’s tumultuous media environment, where they are far less likely to secure lifetime employment at a traditional media outlet. "Our efforts [at Memphis] help to ensure that the media future is rich with diversity and groups often underrepresented in legacy organizations." 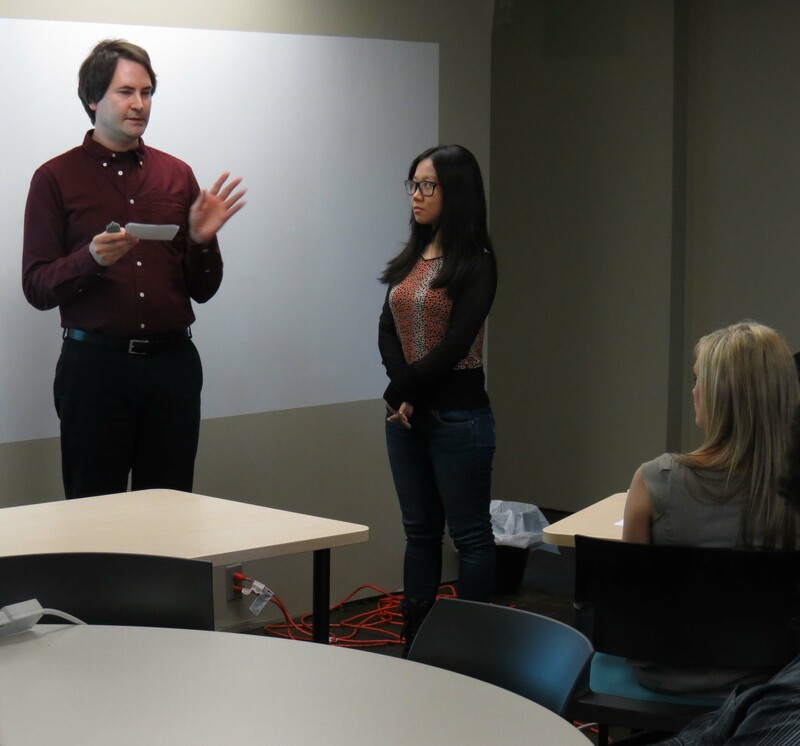 Student Tyler Stafford and Tiffany Zhou give their pitch for app Turn It Off. Photo by Michael Lander. At the University of Memphis where I work, we’ve partnered with Start Co., our local startup accelerator, to develop a new graduate certificate in entrepreneurial journalism and revamp one of the required courses in our M.A. program. Despite the challenges of a slow process of curriculum change and limited resources, we’re excited to launch the program in the fall of 2013, joining a growing cadre of journalism educators in teaching entrepreneurship. And because of our diverse student population in the American heartland, we bring a different take on entrepreneurship than other larger journalism programs. 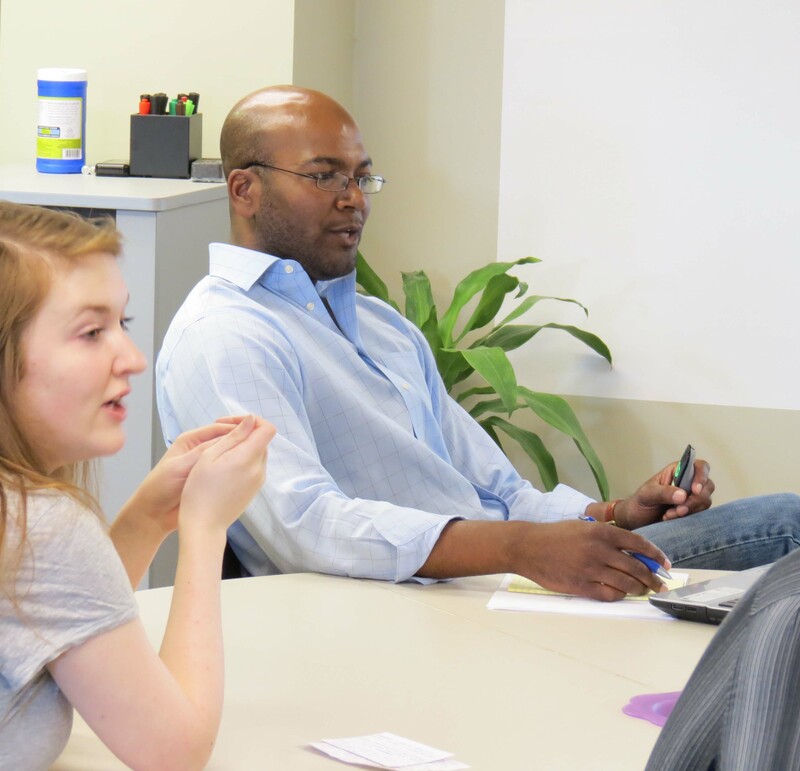 “The formula is simple in that we work with talent, teaching them how to solve problems, test and validate, execute, efficiently pivot, become metric driven, co-work, pitch and present, and so much more,” Andre Fowlkes, the co-president of Memphis’ Start Co. and a key partner in developing the course and certificate, wrote in a letter to university administrators. Like many other deadline-oriented former journalists in academia, I have a tendency to chafe at its slow-moving bureaucracy. Instead of saying “no, because…” entrepreneurs tend to say, “yes, we’ll find a way.” It’s so refreshing my colleague Dr. Lurene Kelley and I have become what you might call local “entrepreneur groupies,” attending as many events and seminars as we can to learn more. It’s also critically important for students, who can not only learn about startups but also how to work as “intrapreneurs” within existing media companies, bringing the innovative ideas and understanding of new business models these organizations need to evolve. The initiative began in spring 2012 when Start Co.’s Fowlkes and journalism professor Dr. Lurene Kelley revamped and co-taught one of four core courses in our MA program, media management, renaming it entrepreneurial journalism. I sat in on parts of that course and took over when Kelley left our program for a new job in fall 2012. The course still covers some management-related concepts, especially those central to changing existing organizations, such as culture and leadership. But much of the semester is focused on building business strategies and investor pitches by working through the business model canvas and the curriculum developed by Start Co. and used as part of their Seed Hatchery boot camp accelerator and other programs. Andre Fowlkes of Start Co. gives the groups feedback. Photo by Michael Lander. The approximately 12-18 student course is divided into teams to work on three startups. The teams begin with a focus on problems to be solved, an entrepreneurship mantra, and move forward by talking to potential customers, researching pricing, revenue and costs, and developing marketing strategies. The semester ends with each group giving a 10- to 12-minute pitch with a slide deck in a public event at the accelerator with feedback from experienced entrepreneurs. This entrepreneurial journalism class is a required component of the four-course graduate certificate, which received official approval in late April and will begin in fall 2013. Students in the certificate program must also take our graduate-level social media course and then have a number of options to choose from for their remaining two courses, including several different offerings from our business school and/or participating in Startup.Co programming for credit, such as their intensive, semi-regular 48-Hour Launch events. The most successful and unique aspect of our effort thus far has been the ability to tap into Memphis’ growing entrepreneurial community and leverage the expertise of people like Fowlkes and Startup.Co’s chief brand officer, Elizabeth Lemmonds. Their knowledge and feedback is crucial to our students, and Startup.Co’s active schedule of entrepreneurial events, including visiting guest speakers like the founder of WordPress and networking happy hours, helps build excitement and motivation among our students. And although I have long had a research and teaching interest in new business models for news, as a journalism professor, my background is primarily in traditional media reporting and editing, not finance, and I don’t have first-hand experience starting a business. I’d encourage other journalism professors to engage with your own community’s startup resources to find similar opportunities. The Scripps Entrepreneurship Institute at Arizona State University, led by Dan Gillmor, was a great help to both Kelley and I in building our knowledge and confidence in our ability to teach entrepreneurship, and other interested professors should apply. Another useful resource is Mark Briggs’ book, “Entrepreneurial Journalism,” which we use as the course text. It helps walk the students through important questions they should consider as potential media startup founders as well as good examples and case studies. It only makes sense to leverage the university’s existing resources and expertise in any new effort, although overcoming academic silos can be a challenge. Our business school administrators were welcoming and happy to include some of their courses as certificate options; one goal going forward is to establish partnerships with computer science as well. We’ve also reached out to and had productive conversations with and support from our campus Center for Entrepreneurship and Innovation and the new Crews Venture Lab. One challenge we’ve faced is the slow, bureaucratic university processes that are anathema to meeting the needs of the fast-changing media landscape. New courses and certificates can only be proposed in the fall and take almost a full academic year to move through all stages of approval, beginning at the departmental level and culminating with the Tennessee Board of Regents. Tweaking an existing course is easier, which is why we began that way, and a graduate certificate program can be a good first step because it’s generally regarded as easier to get support and approval for. My goal was to get something entrepreneurial in place as quickly as possible and to then hopefully expand to include undergraduate students in the near future. Another challenge is that new initiatives like this are driven mostly by the passions and determination of individual faculty members with few additional resources, which can be daunting when a tenure-track professor’s other obligations, such as advising, research, and committee work are considered. Other than one intermittent course release in a 3-3 teaching load to develop and execute the program, efforts to bring entrepreneurship to the curriculum are mostly sustained through long nights, weekends and unpaid summers by professors who are already at risk of burnout. 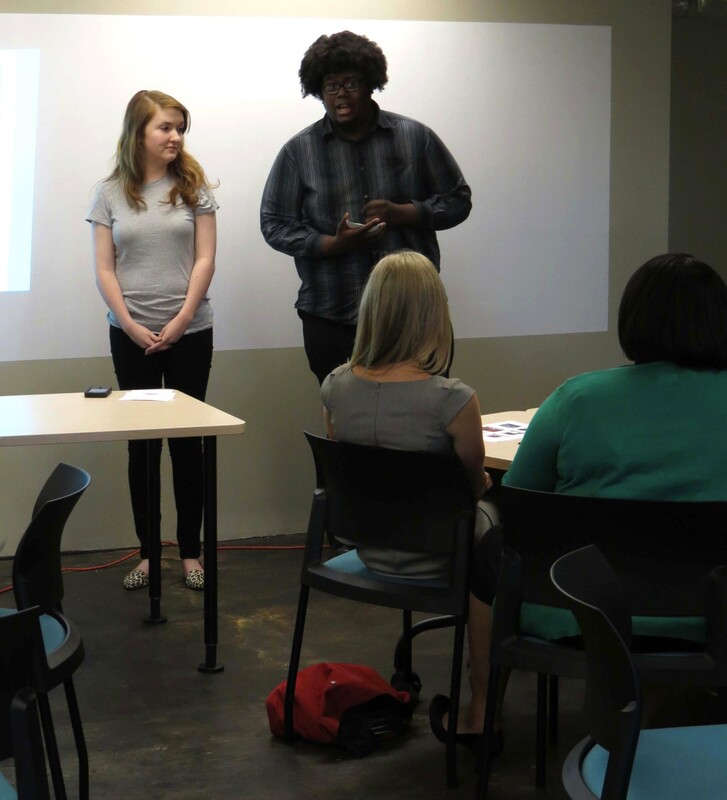 Students Rachel Wilhite and Calvin Carter pitch their site/app Draft901. Photo by Michael Lander. But the rewards in terms of seeing engaged students well-prepared to build the future of news we desperately need are great. Although we haven’t launched a real, successful media startup through our program to date, one of our first entrepreneurial journalism course graduates, Shakia Clark, pitched her own idea at a recent 48-Hour Launch and continues to develop it. Brit Fitzpatrick, an alum who graduated just before we launched this initiative but whom we mentored and encouraged, just became a startup CEO and graduated from the Seed Hatchery accelerator boot camp with a well-received investor pitch for Mentor Me. Last year we got a positive reception to the presentation of our ideas to the local metro daily, The Commercial Appeal, and recently departed executive editor Chris Peck wrote us a letter in support of the certificate. Just a couple of weeks ago, one of our students, Rachel Wilhite, began working for Startup.Co and said she believes the class had a substantial impact on the trajectory of her education. Most encouraging is that University of Memphis shows that injecting entrepreneurship into journalism curricula is possible outside of our more elite journalism schools, and importantly, our efforts help to ensure that the media future is rich with diversity and groups often underrepresented in legacy organizations. Our student body is 42 percent African American, and we draw a substantial number of first-generation college students and a wide range of income backgrounds as well.